Mr. LEACH. Madam Speaker, I yield 2 minutes to my distinguished colleague, the gentleman from Texas (Mr. PAUL). Mr. PAUL. Madam Speaker, I thank the gentleman for yielding me time. Madam Speaker, today I rise in support of this bill. I do not support legislation casually here, and have thought this through. I voted against this bill the first time it went through, and I was one of a few. But it is a better bill now than it was before. I am a supporter of the free market, and I do not believe you can achieve equity by raising taxes and putting more regulations on those who do not have regulations and who do not have taxes. For this reason, I argued the case that instead of equity being achieved by taxing credit unions or making it more difficult for them to survive with more regulations, the best thing we should do now is talk about at least the smaller banks that compete with credit unions, to lower their taxes, get rid of their taxes and get rid of the regulation. Precisely because we dealt with the CRA function in the Senate is the reason that I can support this bill. CRA does great deal of harm to the very people who claim they want CRA to be in the bill. CRA attacks the small, marginal bank that is operating in communities that have poor people in them. But if you compel them to make loans that are not prudent and to make loans that are risky, you are doing precisely the opposite of what we should do for these companies. We should work to lower taxes, not only on the credit unions, and lower regulations. We must do the same thing for the banks. We must lower the taxes and get rid of these regulations in order for the banks to remain solvent and that we do not have to bail the banks out like we have in the past. But the regulations do not achieve this. This is a bill that I think really comes around to achieving and taking care of a problem and protecting everybody interested. But I am quite convinced that this is still not a fair bill, a fair approach, because we have not yet done enough for our community bankers. We must eventually apply these same principles of less regulations and less taxes to the small banker. Then we will provide a greater service to the people that are their customers, and we will certainly be allowing the poor people a greater chance to achieve a loan. Since I strongly support the expansion of the field of membership for credit unions and was the first one in this congress to introduce multiple common bonds for credit unions in the Financial Freedom Act, H.R. 1121, I am happy to speak in support of the passage of H.R. 1151 here today. Having argued forcefully against the imposition of new regulations imposed upon credit unions, I congratulate the senate for not increasing the regulatory burden on credit unions in an attempt to level the playing field with banks and other financial institutions. A better approach is to lead the congress toward lower taxes and less regulation — on credit unions, banks and other financial institutions. H.R. 1151, The Credit Union Membership Access Act, as amended by the senate, takes us one step in the right direction of less government regulation restricting individual choice. We must continue on the path of fewer regulations and lower taxes. These regulations add to the costs of operations of financial institutions. This cost is passed on to consumers in the form of higher interest rates and additional fees. These regulations impose a disproportionate burden on smallers institutions, stifles the possibility of new entrants into the financial sector, and contributes to a consolidation and fewer market participants of the industry. Consumers need additional choices, not congressionally-imposed limits on choices. The estimated, aggregate cost of bank regulation (noninterest expenses) on commercial banks was $125.9 billion in 1991, according to The Cost of Bank Regulation: A Review of the Evidence, Board of Governors of the Federal Reserve System (Staff Study 171 by Gregory Elliehausen, April 1998). It reports that studies estimate that this figure amounts to 12 percent to 13 percent of noninterest expenses. These estimates only include a fraction of the most burdensome regulations that govern the industry, it adds, The total cost of all regulation can only be larger . . . The basic conclusion is similar for all of the studies of economies of scale: Average compliance costs for regulations are substantially greater for banks at low levels of output than for banks at moderate or high levels of output, the Staff Study concludes. Smaller banks face the highest compliance cost in relation to total assets, equity capital and net income before taxes, reveals Regulatory Burden: The Cost to Community Banks, a study prepared for the Independent Bankers Association of America by Grant Thornton, January 1993. For each $1 million in asset, banks under $30 million in assets incur almost three times the compliance cost of banks between $30�65 million in assets. This regulation almost quadruples costs on smaller institutions to almost four times when compared to banks over $65 million in assets. These findings are consistent for both equity capital and net income measurements, according to the report. We need to work together now to reduce the regulatory burden on all financial institutions. The IBAA study identified the Community Reinvestment Act as the most burdensome regulation with the estimated cost of complying with CRA exceeding the next most burdensome regulation by approximately $448 million or 77%. Respondents to the IBAA study rated the CRA as the least beneficial and useful of the thirteen regulatory areas surveyed. We need to reduce the most costly, and least beneficial and useful regulation on the banks. Lets all work together now, credit unions, banks and other financial institutions, to reduce their regulatory burden. Credit unions have demonstrated that fewer regulations contribute to lower costs passed on to consumers and greater consumer choice. Lets extend that model for banks and other financial institutions. 1998 Ron Paul 93:1 through 1998 Ron Paul 93:7 were spoken on the House floor. The rest of this speech was inserted into the Congressional Record as an extention of remarks. 1998 Ron Paul 93:1 Madam Speaker, I thank the gentleman for yielding me time. Here, Ron Paul thanks The Honorable James A. Leach of Iowa. 1998 Ron Paul 93:5 CRA does great deal of harm probably should be CRA does a great deal of harm. 1998 Ron Paul 93:8 I congratulate the senate probably should be capitalized: I congratulate the Senate. 1998 Ron Paul 93:9 the congress probably should be capitalized: the Congress. 1998 Ron Paul 93:9 amended by the senate probably should be capitalized: amended by the Senate. 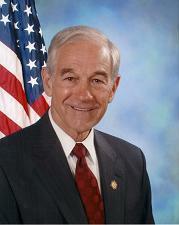 1998 Ron Paul 93:10 congressionally-imposed probably should br capitalized and not hyphenated: Congressionally imposed. 1998 Ron Paul 93:12 For each $1 million in asset probably should be plural: For each $1 million in assets.